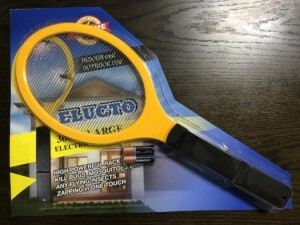 ZAP Bugs with just ONE SWAT – The ELUCTO Electric Fly Swatter is a highly reliable and powerful tool everyone should have because it will zap insects or flies in ONE SWAT only. There is no need to swing it several times in a row like it happens in the case of the 3-layered Bug Zapper Rackets. 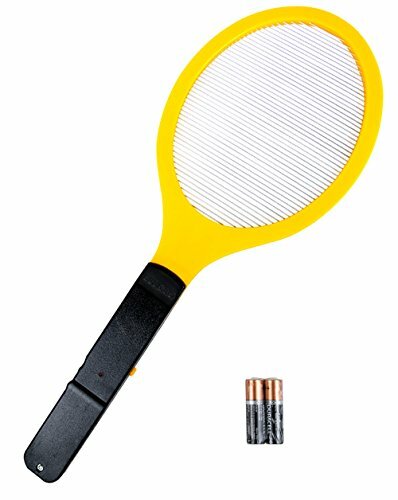 Immediately Use without waiting it to Charge – Place inside 2 DURACELL AA batteries (included in the package) and this Bug Zapper Racket will start working on the spot, with no delays. 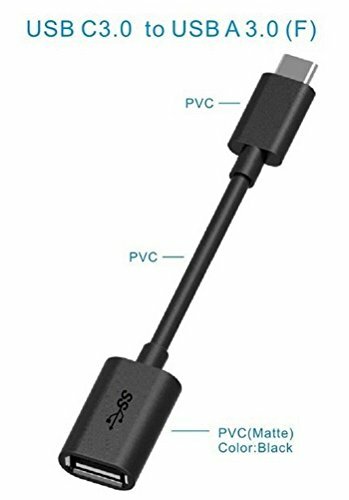 There is no need to wait for it to charge each time you need to use it. You should also stop worrying about issues created by a defect battery or charger, as you can always replace the AA on your own, fast and easy. Just take and use this mosquito zapper on the stop, stopping these pesky bugs to bother you again. Extremely Easy to Clean – This One Layer Bug Zapper is easy to clean after you are done using it. Due to its single-layer design, the flying insects will not be caught inside, so you won′t have to do the dirty job of cleaning them off. No Environmental Safety Concerns – Forget about toxic bug sprays that are filled with chemicals and completely inappropriate to use during a barbecue or when eating outside, because they can contaminate your food or get inhaled. The mosquito zapper does not present any risks to your safety and it is environmental-friendly as well. The device is entirely made out of new ABS plastic and not recycled ones. You can enjoy a 1-Year Full Warranty and even more than this – If you encounter any issues with the Electronic Fly Swatter, we will replace it or offer a refund if we cannot provide 100% customer satisfaction. Even if the 1-year warranty expired, don’t hesitate to contact us if there is something wrong with your Bug Zapper and we will offer a solution for you. Choose to Eliminate PESKY BUGS for good. Forget all about bug bites and GET YOURS TODAY! Forget about bug bites. It is time to get pleasure from a good day outdoors, in spite of what you choose to do. With an easy move with THE ELUCTO Electric Fly Swatter! Any bug attacking you and your family are going to be zapped on the spot. 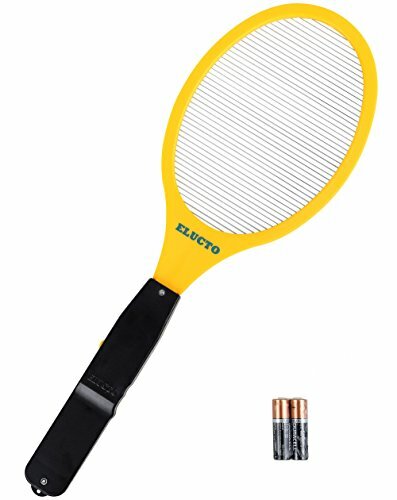 The ELUCTO bug zapper racket can turn out electrical shock waves that may destroy bugs in a second, without you even feeling. Its incredibly comfortable and practical design will help you neutralize insect in just one move. Just swing the device in the direction of the bugs and they are cooked after they reach its surface. Always avoided cooking outside because of the bugs? With the Fly Swatter mosquito killer, any bug flying your way will be eliminated. Keep your food delicious and safe, by not using bug sprays with dangerous chemical content. You do not need to wonder if the device is on and working. Whenever you press the yellow button, a RED light will let you know that it is ready for use indoors and outdoors. To avoid misusage or children getting hurt, the switch for operating the fly zapper in on the handle. It desires for you to press on it each time you wish to activate it. It operates on 2 DURACELL AA batteries(Included in the package). You can enjoy a 1-Year Full Warranty and even more than this – If you encounter any issues with the Electronic Fly Swatter, we will replace it or offer a refund if we cannot provide 100% customer satisfaction. Even if the 1-year warranty expired, don’t hesitate to contact us and we will offer a solution for you.